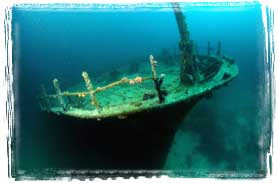 One of the real treasures of shipwrecks is the opportunity they provide to explore the past. Wrecks can serve as important habitats for fish and other aquatic life because their substrate acts as an artificial reef for entire ecosystems. Invertebrates, such as mussels, sponges, scallops and sea fans, attach themselves to the hard surface of the wreck. Since these organisms often support higher levels of the food web, fish populations often congregate and propagate in the safe haven of the structure. The abundance of life and biodiversity found on wrecks can be similar to that of the world’s most pristine coral reefs. Divers are privileged to have access to underwater sites that are part of our cultural heritage or maritime history. To preserve the sites for future generations, it is important to be informed, dive responsibly and treat shipwrecks with honor and respect. Divers must be responsible when exploring these submerged sites, looking after themselves, the environment and the cultural heritage. Project AWARE created the Respect our Wrecks campaign to educate divers about preserving our underwater cultural heritage and demonstrate the environmental value of such sites. As a diver, if you find an object or wreck that may be of historical importance, leave it where it lies, mark its position and seek advice from local government authorities.